One of many charts in the State of Pet Health Report from Banfield Applied Research and Knowledge. Earlier this month, national veterinary chain Banfield released the findings of their second annual State of Pet Health 2012 Report, conducted by their research team, Banfield Applied Research and Knowledge (BARK). Compiling data from the nearly 2 million dogs and 430,000 cats cared for by Banfield, BARK analyzed the findings and discovered some alarming trends, especially when it came to chronic diseases in companion animals. Perhaps the most startling statistic is in the category of obesity. Banfield found that, since 2007, the number of overweight or obese dogs seen by a Banfield practice has increased by 37 percent. For cats, the number is even more shocking, with Banfield seeing a 90 percent increase in overweight or obese felines. Obesity in pets has been linked to a number of health issues, including canine and feline diabetes, high blood pressure, arthritis, and respiratory problems. 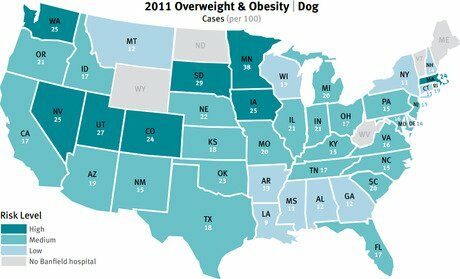 Pet obesity numbers were highest at Banfield practices in Minnesota, South Dakota, Oklahoma, and Utah. Other chronic ailments are also on the rise, according to Banfield’s data. Arthritis has increased by 38 percent in dogs and 67 percent in cats over the past five years. Canine and feline kidney disease, thyroid disease, and heart disease are much more prevalent as well. Though the report indicated a sharp increase in the number of chronic diseases contracted or inherited by dogs and cats, it also showed that only 36 percent of dog owners would take their dog to a regular veterinarian for preventative or disease management treatments. The number is even lower for cat owners; only 28 percent said they would be taking their kitties for regular visits to the DVM. For more information, download a full copy of the State of Pet Health Report.